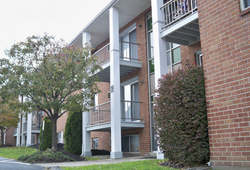 With over 50 years in the Real Estate business, no one knows better than the team at Belmont Village Apartments, located on Ross Road in King of Prussia. Traditional country living in a beautiful landscaped setting is what awaits you at Belmont Village, King of Prussia’s best kept secret. We have spacious apartments, walk-in closets with additional bedroom closets, remodeled kitchens and baths, and wall to wall carpeting, making this community well-designed and still affordable. Studios are $825 per month, 1 Bedrooms $1,145 per month (standard), 2 Bedrooms $1,295 per month (standard) and Deluxe 1 Bedrooms from $1,195 per month. Heat/Water/Maintenance/Sewer/Trash is included! A laundry facility and extra storage is in each building. Apartment units are going fast, so please call us today to find out more information and special promotions at Belmont Village Apartments. If you are looking to make Belmont Village Apartments your home, call us, the company that offers you an unparalleled combination of knowledge, selection and service. Michael Singer Real Estate properties please click here. 1 ½ mile on the right.